Paper Daisy Crafting: Are you ready to grab a bargain? Are you ready to grab a bargain? Wow! There are so many offers going on at Stampin' Up just now, that its hard to keep up. There are some really fantastic bargains to be had over the week 21st - 28th November. In addition to these week long offers, there are additional products on offer, with up 40% savings, on both Monday 21st and Monday 28th November for 24 hours only. So the key is to look at all the tables carefully, decide which products you want to save on, and then place your order on the appropriate day. Please don't miss out. If you want to order, clicking on the "Shop Now" button at the top of this page will take you through to my online shop. Or you can order direct through me by email or telephone. And if you are local to me (Chertsey, Surrey) and you can collect your order, you can even save the cost of the shipping. Please also remember that if your order is £150 or above, in addition you will receive 10% of what you spend, in free products. And as well as this I send every customer a little thank you gift in the mail. What's not to like? So, without any more delay,what are the discounted products? 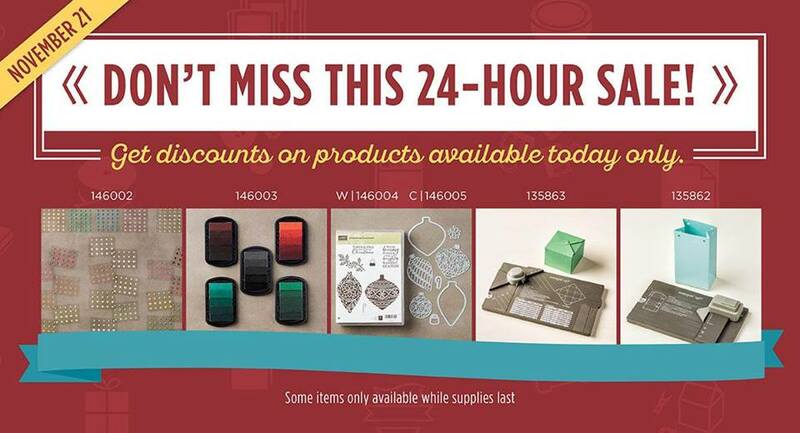 The products seen above are only available for 24 hours on Monday 21st November. These products have huge discounts. For the whole week from 21st - 28th November there are a whole host of products you can order - too many for me to list here, but for your convenience, there’s a PDF here that you can print off and peruse at your leisure. Also, just a reminder that the best selling Stitched Shape Framelits Dies are only available until tomorrow (21st November) and there is no information as yet when they will be available for sale again. Click on the link at the bottom of this post to buy them while there is still time! And lastly, there is a 25% discount off selected stamp sets until 30th November. Again click on the product links at the bottom of this post. Phew! I did say there are A LOAD of offers!